Mobile solar panels produce up to 60% more energy. Mobile solar panels are far more efficient since they follow the sun but require either a sophisticated tracking device or need to be turned manually. This page was updated on 27th November, 2016. Since I'm no electronics expert this page is only to do with mobile PVs that can be manually moved to retain maximum exposure to sunshine. 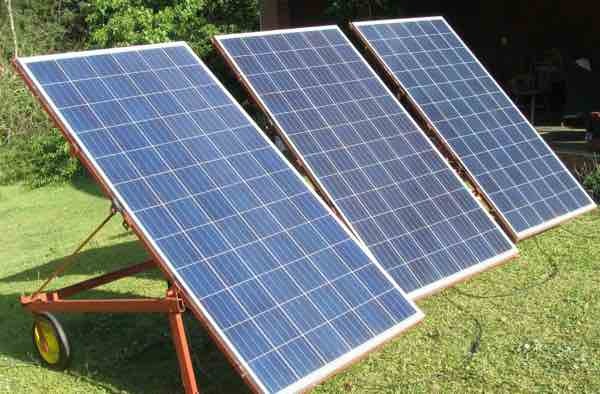 PV panels capture solar energy turning it into direct current usually maximally at around 45V. Losses in the cables are fairly high at this voltage, so we like to put three in series; controllers generally won't cope with more than about 150V. 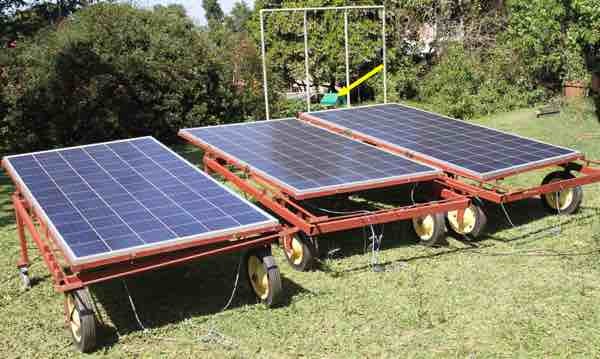 One could put all three panels on one mobile trailer which can be easily turned to track the sun, or three separate smaller ones. Both have their merits, depending on circumstances. Turning just one trailer obviously is simpler, but the construction needs to be a lot heavier. Mobile solar panels produce up to 60% more energy. By changing the angle of the panel one can retain maximum exposure to radiation both in summer and winter, and early morning or afternoon, or at midday. I have used the deckchair principle enabling me to make the panels steeper for early and late in the day, but able to lay them flat around noon in summer when the sun is directly overhead. Having a number of stops, one can select the correct orientation according to the position of the sun. The area around my home has trees and various walls so three individual mobile carts is more practical. Turning them is not arduous, but care has to be taken not to unplug the cabling. It takes just a few minutes, three times a day; one could do it every hour if you had the time, or if suddenly in need of extra energy when the good wife wants to turn the oven on. In the early morning and late afternoon, when the sun is just above the horizon, assuming there is minimal shading from trees and other buildings, the mobile solar panels need to be almost vertical. In this situation they are vulnerable to strong winds, so a protective chain is necessary. It's always advisable to drop the panels during inclement weather to prevent damage. On the other hand, during a hailstorm you would want them as steeply oriented as possible. Then as the sun rises high in the sky, and moves to the north or south, the angle of the panels must be lessened, and the trailer turned to maintain maximum radiation. A sophisticated solar tracker would do this continuously every moment; in practice I move mine about three or four times a day, depending on the need for electricity. For example, if you know the dishwasher is about to come on, then you would want to make sure they are directly facing the sun. For my mobile solar panels, I chose two types of wheels, one of fixed orientation and the other able to turn; a brake on one or other would be advisable in case of strong winds; in practice, being retired and at home most of the time, it's almost never used however. Fortuitously, not in the planning, the large fixed wheels ended up being lower than the smaller rotating wheels. Instead of turning the panels in the late afternoon through 90 degrees, simply dropping them means they retain most of the sunshine, and are still surprisingly effective. It means I don't have to do a major turn the next morning, which is bothersome. Notice the green cover, arrowed, over the pump that supplies our home with rainwater from the reservoir. These three panels will amply supply the electrical demand. These experimental mobiles were really just an exercise for fun. They are not a substitute for fixed panels on some roof or ground level structure. Nevertheless, they have provided a useful boost to our solar power energy, especially in the early morning and late afternoon when they will exceed the output of those on the roof that face directly north; this is especially important after the equinox when the sun moves south of due east and west. Should there be interest, you could contact me, I could put together a pdf on how to construct your own trailers. Knowing how to weld would be essential; it's neither dangerous nor difficult and certainly a skill worth learning for the person who enjoys backyard jobs. I confess that building these trailers took a lot of thinking and planning, time but only a small expense; but then I have little interest in watching television, so I have more hours to enjoy pottering in the workshop or garden. I did consider putting them up on a pole, far easier to turn, but extreme weather conditions put me off; they could be dangerous if they came loose in high winds. This is a commercial solar sentry trailer that is more mobile; and a lot more expensive. We are again reassessing our decision not to go off the grid; a recent surge of dirty power from the utility, coupled with another massive price increase in 2019 makes it all the more attractive.